The Imperial Eagle, Aquila heliaca, is very similar to the Golden Eagle, although slightly smaller (length 80 cm, wingspan 200 cm). 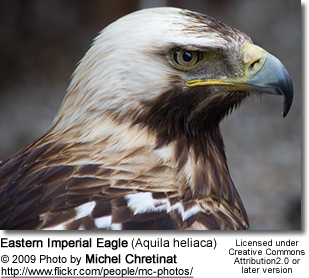 Like all eagles, A. heliaca belongs to the bird of prey family Accipitridae. 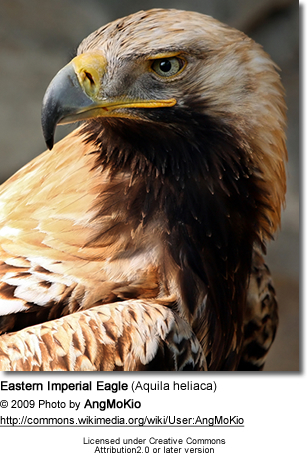 Imperial Eagles are distributed throughout southeastern Europe as well as western and central Asia. The Spanish Imperial Eagle, found in Spain and Portugal, was formerly lumped with this species, the name Imperial Eagle being used in both circumstances; however the two are now regarded as separate species due to significant differences in morphology, ecology, and molecular characteristics. 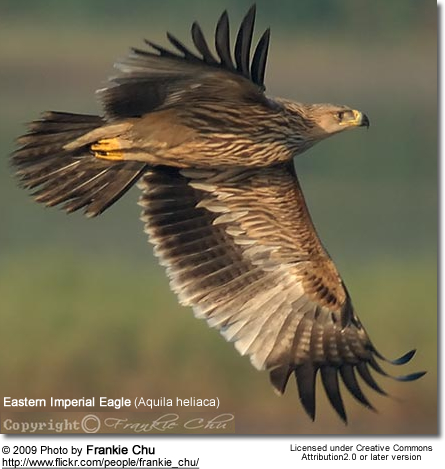 In the winter the Eastern Imperial Eagle migrates to Africa, India and China. In Europe, the Imperial Eagle is threatened with extinction. It has nearly vanished from much of its former range, e.g., Hungary and Austria. Today the only European area in which the population is rising is the Carpathian basin, mainly the northern mountains of Hungary and the southern region of Slovakia. The nesting population in Hungary is approximately 70–80 pairs. The monarchy of Austria-Hungary once chose the Imperial Eagle to be its heraldic animal, but this did not help this bird. The eagle's preferred habitat is open country with small woods; unlike many other species of eagle, it does not generally live in mountains, large forests or treeless steppes. Eastern Imperial Eagles generally prefer to construct a nest in a tree which is not surrounded by other trees, so that the nest is visible from a considerable distance, and so that the occupants may observe the surroundings unobstructed. Tree branches are taken in order to build the nest, which is upholstered with grass and feathers. In March or April the female lays two to three eggs. The chicks hatch after 45 days; often, however, only one will survive to leave the nest, with the others dying before becoming fully-fledged. The Eastern Imperial Eagle feeds mainly on susliks, in addition to other rodents, as well as martens, dogs other and birds.